Go Go Gelato! : Using 4 cones, 3 scoops, 2 hands, and 1 challenge card, players, (2-4), fill customers’ orders as quickly as they can! Pass the scoops back and forth between your cones, being careful to not touch or drop them. Work quickly to figure out the best way to satisfy your customers before your opponents do. Make your cones and scoops look just like the ones on the card, or you’ll lose the race. 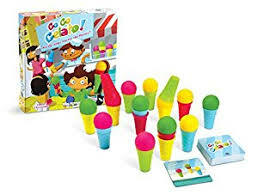 That means matching correct cone and scoop colors and arranging them in proper order. Similar in design to Dr. Eureka, but more suitable for younger children. Helps reinforce visual-spatial skills, problem solving, attention to detail and hand and arm skills.